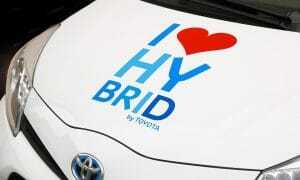 A hybrid car is a vehicle that combines a petrol or diesel engine with a battery-powered electric motor. A regular hybrid car cannot be charged at an electric charge point since there is no plug-in option. Instead the battery for the electric motor is charged by energy that’s produced from the car braking or from the engine. Below are some of the main advantages and disadvantages of a hybrid car as well as some info to help you decide if it’s the right type of car for you. Hybrid cars are a very popular choice with city drivers since they enable you to drive on electric power for shorter distances, helping to cut out emissions and save on fuel costs. Hybrid cars will also turn off the engine when the car is at a standstill, reducing fuel and emissions further. Hybrid cars that have a diesel engine offer diesel levels of economy with the added benefit of being able to run on electric power over shorter distances. The fact that braking charges the battery the powers the electric motor makes hybrid cars ideal for city driving and enables you to take advantage of the electric motor more compared to a rural setting. Hybrid cars are convenient in that they do not need to be plugged into a charge point to use the electric motor. A hybrid car enables you to get the performance of a car with a larger engine but with the benefits of a smaller one i.e. reduced fuel consumption and lower emissions. The cost of a hybrid car is higher when compared to an equivalent petrol or diesel car although this is tempered by the fuel savings in the long run. Hybrid cars don’t offer much advantage if they’re mostly being used for long distance travel. The majority of hybrid cars cannot be used to tow other vehicles. Hybrid cars are an ideal choice if your driving time is split between urban and rural areas. While driving in built up traffic you’ll be able to benefit from the electric motor and the savings in fuel costs. When driving in rural areas though, you won’t be hindered since you still have the performance of a regular petrol/diesel engine.